2014 has been jam-packed with anniversaries significant to classic film lovers. The year has marked not only the on-screen centennial of Chaplin's "Little Tramp," but also the centenary birth dates of many silver (and Technicolor) screen luminaries including Alec Guinness, Hedy Lamarr, Ida Lupino, Tyrone Power, Jane Wyman and Richard Widmark. 2014 also marks the diamond anniversary of the premiere of Gone with the Wind 75 years ago in December, 1939. And 70 years ago On the Town, the musical that catapulted the writing team of Betty Comden and Adolph Green to fame, made its much-heralded debut on Broadway in December, 1944. The pair went on to script its 1949 screen adaptation as well as screenplays for Singin' in the Rain (1952), Auntie Mame (1958) and more. There's been much to celebrate, and the revelry continues. Beginning November 14 the Hollywood Museum in the fabled Max Factor Building pays tribute to "Tyrone Power: Man, Myth & Movie Idol," a celebration of Power's centennial year. The exhibit will feature a wide-ranging assortment of never before shown items collected by family, friends, private collectors and the Hollywood Museum. Exhibit highlights include costumes Power wore in some of his best-known films, including the matador "suit of lights" from Blood and Sand (1941) and a pair of embroidered pants from The Mark of Zorro (1940); costumes worn by his leading ladies and co-stars, including pieces from In Old Chicago (1937), Marie Antoinette (1938), Nightmare Alley (1947) and The Long Gray Line (1955). Personal mementos and photos will also be on display as well as copies of Power's scripts - from his own collection - for Love is News (1937), In Old Chicago (1937), Blood and Sand (1941) and The Razor's Edge (1946), along with lobby cards, posters, press kits, press books and sheet music from songs from his many films. Check the museum website or call 323.464.7776 for more information. As the Hollywood Museum launches its Power exhibit, the Movie Memories Foundation is set present two of Tyrone Power's most popular films - Alexander's Ragtime Band (1938) on Friday, November 14, and Captain from Castile (1947) on Saturday, November 15 - in celebration of his centennial year at Hollywood's Barnsdall Gallery Theater. Click here for ticket information. 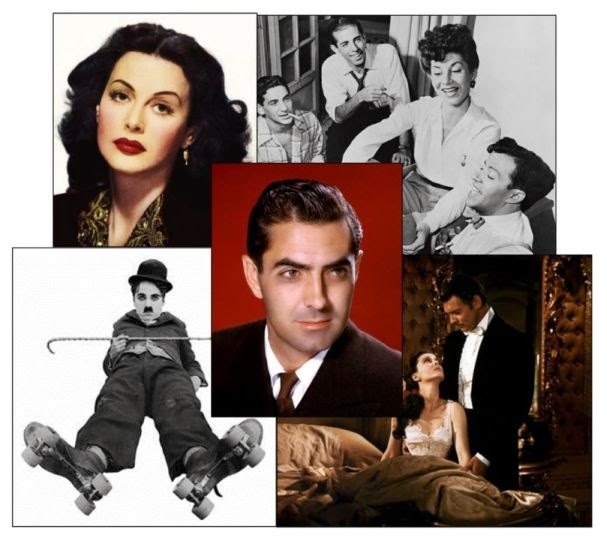 For more on the life and career of Tyrone Power, see Remembering Tyrone Power. If you happened to miss the blogathon I co-hosted on Ty's 100th birthday, May 5, check out Power-Mad. Just about exactly 75 years after On the Town debuted on Broadway, a revival - the third since the original production - is lighting up the Great White Way once more. 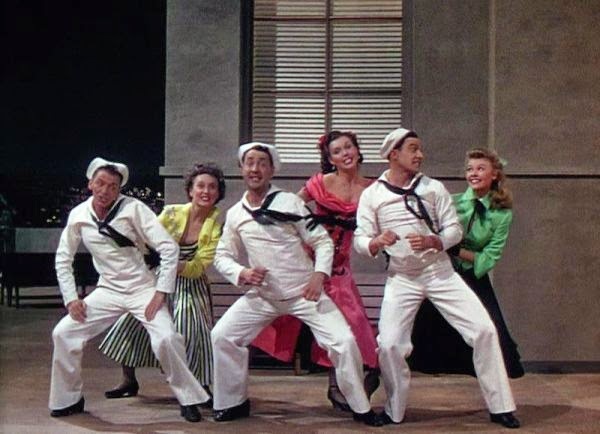 Boasting book and lyrics by Comden & Green, music by Leonard Bernstein, choreography by Jerome Robbins and directed by George Abbott, On the Town opened to jubilant raves in 1944. Revivals in 1971 and 1998 weren't especially well-received, but Ben Brantley of The New York Times has greeted the 2014 production with a five-star review, rejoicing, in part, "Designed in a spectrum of jelly-bean hues that makes vintage Technicolor look pallid, this is a parallel-universe New York in which hectic urban life acquires the pace and grace of a storybook ballet. It's a bustling, jostling cartoon that also floats like a swan..." Even Adolph Green's son, Adam, thinks that director "John Rando's new On the Town...seems to have gotten it just right." 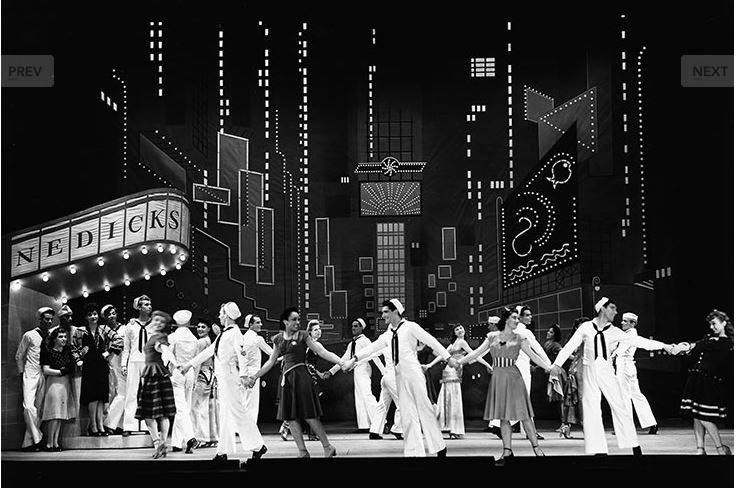 On the Town is at the Lyric Theatre in Manhattan now through May 2015. 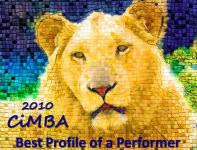 Planning to be in New York, New York (it's a helluva town) during the musical's run? Click here for ticket information. If not, watching the Stanley Donen/Gene Kelly film adaptation one more time seems a fine way to observe On the Town's 70th birthday. This really has been a big year for anniversaries! 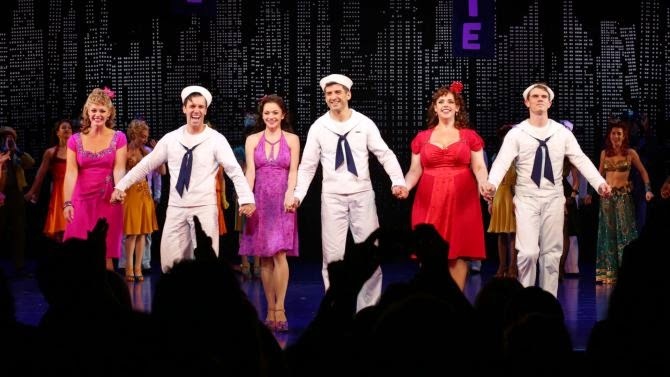 I'm pleased to see "On the Town" is playing in New York, and to good reviews, too. Great post! It has really been an amazing year of anniversaries. So far, I've been able to be a part of celebrations of the centenaries of Alec Guinness and Tyrone Power - would love to manage to get to see this latest "On the Town" revival on Broadway. I love On The Town and everything Comden and Green wrote. I was fortunate enough to see the two of them in person at a concert version of the show in London - Tyne Daly was in the Betty Garrett role. Comden and Green are favorites of mine, too. How wonderful that you had the opportunity to see them in person. Thanks for reminding us of these anniverseries, as they are so relevant to us classic movie (an theater) fans. I'll go see the Tyrone Power exhibition while I'm at the TCM film festival. And I was lucky to have already seen the On the Town revival in New York. It was fabulous and well cast, although you really can't expect to see Gene Kelly or Frank Sinatra clones, or Vera-Ellen or Ann Miller for that matter (and who could replace Jules Munchin?). But it's great nonetheless. And as you suggest though, I think I'll have to see the movie. I was invited to an opening night event this week in Hollywood for the Ty Power exhibition but (sigh) am not able to attend. Hoping to be able to see it before it closes (which, I think, is before the 2015 TCMFF). I am green with envy (while very happy for you) that you've seen the new "On the Town" revival. Fortunately, it runs through May, so I may yet have a chance to see it. Two great events, Eve! 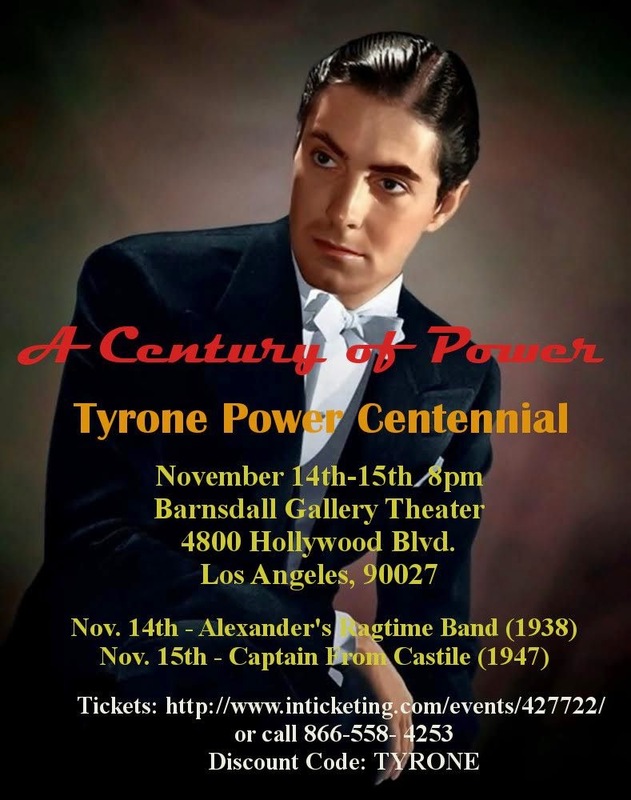 Someone sent me some promotional info on the Tyrone Power centennial and it looks amazing. Hard to believe ON THE TOWN is 70--it sure doesn't look it! I'm very happy there are events in Hollywood to commemorate Ty's centenary. The launch of the exhibit and the screenings of his films also coincide with the anniversary of his passing on Nov. 15, 1958. There is a memorial service at his grave site every year that is attended by his children and other family members as well as many fans. I'm feeling a bit deprived that I have yet to see On the Town. The TV ads for it look amazing. I have to leave it to the west coast folks to revel in Mr. Power. I'm going to try to get some tickets to OTT before it closes. I can hear the music in my head! Luckily, you've got 6+ months before it closes. I don't very often get excited about Broadway shows these days, but this revival has me wanting to get on the next flight to New York. Enjoy!